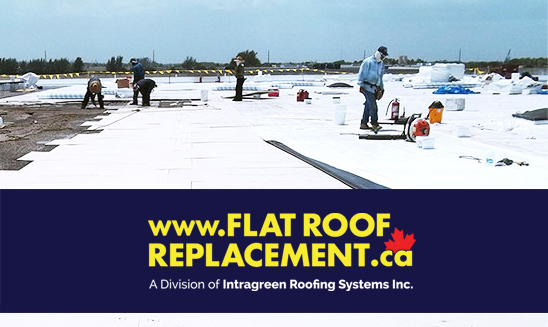 FlatRoofReplacement.ca is a local and trusted Toronto based flat roofing company that offers quality commercial, industrial and residential flat roof replacement, repair, recovery and maintenance services at affordable prices. FlatRoofReplacement.ca takes pride in a strictly dedicated service to flat roofing systems in the Greater Toronto Area and offer long-term, cost-effective and sustainable flat roof replacement and repair solutions. We encourage commercial and industrial property managers and business owners to have our professional flat roof inspectors assess your flat roof for any issues in order to keep your flat roofs free from leaks. If it is noticed that the flat roofing membrane is beginning to wear or a flat roof leak is developed after a heavy rain storm, do not hesitate to immediately call us. Interior damage to the offices and buildings happens quickly when there is a specific need for a partial or full flat roof replacement or repairs. Our professional roofing crews are qualified and ready to provide lasting flat roof replacement solutions. Disasters can happen at the most inconvenient time, that is why we make sure to be available and ready to respond with reliable flat roof emergency services when customers need it the most. We provide emergency flat roof replacement and repairs when needed including Saturdays, so that property owners can address any flat roof complications prior to serious structural damages taking place. FlatRoofReplacement.ca provides the Greater Toronto Area property managers with a flat roofing service that they can afford. As a professional flat roof replacement contractor, we provide customers with honest estimates to approve before any work commences. 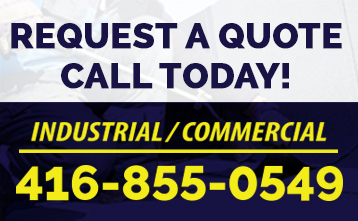 Our mission is to keep our rates affordable and quality of workmanship high. We stress the importance of customer service throughout the roofing process and implement timely service and accurate responses to customer questions in order to meet that goal.